On Thursday I ventured along to the open evening at the Apollo Spa in the Corinthia Hotel at St.Georges bay. I've been to the hotel before, I used to use the personal trainer in the gym there and always walked through the Spa area and thought it looked lovely. When I received my invite it mentioned that they had new treatment rooms, so I was looking forward to checking it out. When you first walk into the spa area you walk past the pool, and it looks such a nice relaxing pool, I always wanted to go, but never got round it. When we arrived we were greeted at the reception by a member of staff who handed us our envelopes with special discounts , after filling in our details we were show towards the treatment rooms where another member of staff showed us around the newly refurbished rooms. As part of the open evening they were demonstrating their treatments so you could receive a free back massage, facial, or manicure. I put my name down for a facial as I was needed one anyway. After the treatment room tour I made my way back to the reception to grab a drink while I was waiting for my facial. I love spa's, I just love their whole cosy feeling, there is nothing better than relaxing in a big fluffy robe and slippers! 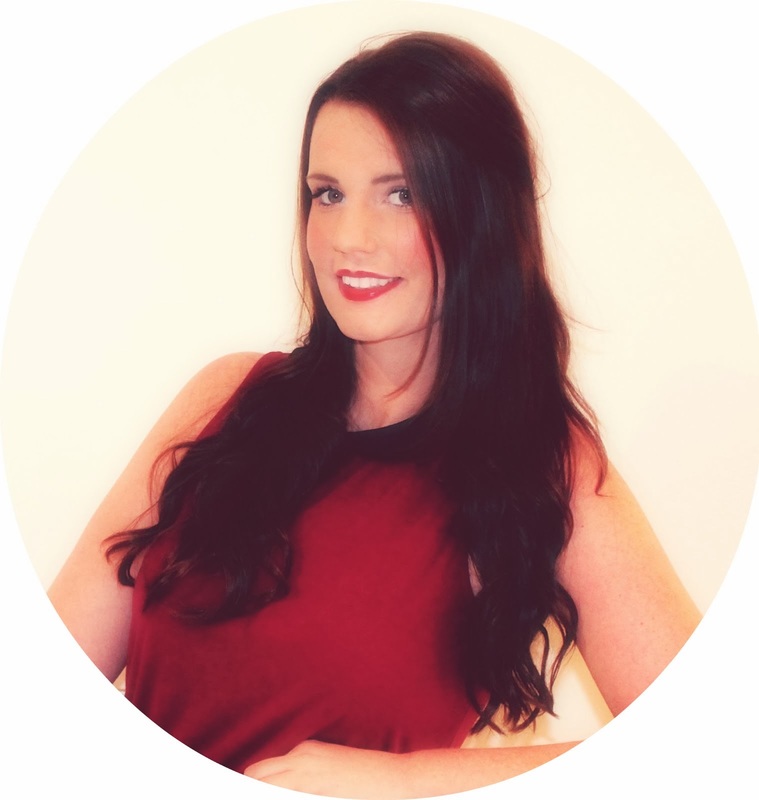 When it was my time for my facial I made my way back through to one of the treatment rooms, it was dimly lit and felt really welcoming. I lay down on the bed as the therapist got to work. She mentioned she was using Yonka products, which i've never tried before but smelled soooo amazing. It was just a mini facial so I was only there for around 15 minutes, but it was so nice and relaxing. It was nice to actually sample their services on an open day, it definitely made me want to go back for more! On the evening we received a 30% discount voucher, so I couldn't resist and booked myself in for a pedicure next weekend, with that I also get to use the spa facilities, so I'm looking forward to making a day of it with some lunch and relaxing by the pool. Have you been to the Apollo spa before? Which is you favourite Spa? Here in Malta there isn't as many launch parties or products events like there is in London, I'm always jealous of the London bloggers who get to these cool events, but Malta is my home for now and I try to make the most of what the little island has to offer. Today my local beauty salon was having an open day, they had jewellery and clothing on sale, and also were promoting their services. I went along to show my support as you couldn't meet a friendlier bunch of people who always make me feel more than welcome. I have the same person doing my nails every time and I've come to consider the staff my friends. Once a month I go to get my nails done and we all catch up on each others gossip and talk about our latest beauty finds. Jewellery was by Jazzy Jewelz (www.jazzyjewelzmalta.com), they had a massive selection to choose from so it was hard to walk away empty handed. I bought myself a ring and some bracelets. The bags,scarfs, belts and clothing were from Ferramoda, who last night held their fashion show at the Radisson blu in St.Julians. Their pieces are all unqiue and hand made from Italy. If your looking for a beauty salon in, I can highly recommend Beauty & co in Swieqi. I've been going for over 3 years for all my beauty needs and can't fault them at all, they are really an all round great salon. At the weekend I ventured along to the MFCC here in Malta for the Me am Chic event. As far as days out go for malta, this was one of the better things I've found to do. Being away from the UK I miss out of things like 'Girls day out', which is right up my street. So when I saw the Me am Chic event, I couldn't wait to go. Mainly because it's something different to do. There was loads to see, and there was some brands there I was surprised to see in Malta, one of them being Dermalogica. As one of my favourite skin care brands, I was happy to learn they've just launched a stand at The Point! There was Sienna tan, dove, macadamia oil, Threads (threading booth - that i took the opportunity to tidy my eyebrows up! ), schwarzkopf, Bourjois, revlon and much more! I went on the Sunday, but throughout the weekend there was Nail Compete, a stiletto race, a 50 shades of grey treasure hunt, fashion shows and much more. I was so happy to find out that the girl who does my nails won all 3 categories that she entered in Nail Compete, she really does an amazing job. Well done Faye! I went along with my friend Lisa and enjoyed a few hours browsing all the stalls seeing everything they had on offer. I was also invited to drop by the schwarzkopf stand, where I received some lovely goodies to review, so i'll be blogging about them shortly. All in all I had a great day out, it was nice to do something different in Malta, and i'll be sure to attend next year. Did you visit Me Am Chic? As part of my Sephora Haul I got some of Sephora's own lip glosses to try. One of the shades I picked up 09 Christmas Candy, just to get me in to holiday spirit. Christmas candy is a red coloured gloss, but goes on rather sheer, it also has glitter in it, perfect for those christmas parties coming up! While there isn't much colour, one thing I do love is the smell and taste, it's fruity, but not over powering, just enough to go "oooh" when you're putting it on. The formula couldn't be any better either, it slides onto the lips and isn't sticky what so ever which I love. No one likes a sticky lip gloss!! Have you tried the Sephora Lip glosses - what's your favourite shade? I actually picked this product up a month or so ago but have just got round to using it which is quite unusual for me as I normally can't wait to get my hands on something and start playing with it start away. So last weekend I opened this much raved about product up and decided to give it a go. When I purchased this, the guy told me I can use a kabuki brush to apply this with all over, but I read a tip on another blog to apply it with the Real Technique conturing brush, so thats what I did. The product it's self looks like a mouse, but its a lot firmer than that and a little goes a long long way, I only need a swirl or two to do most of my conturing which I was surprised about. And while the colour looks quite dark, I couldn't of went on any more natural for me, I was worried about looking orange, but it just gives you the move natural sun-kissed look. Anyone looking for a new bronzer, i'd 100% recommend trying this ok. This has to be one of the best bronzers I've ever used. If you're in Malta, you might be able to purchase this from Franks. Have you the Chanel Bronzer, do you love it? I've been waiting for this product to arrive for a few weeks now, I was starting to think it had got lost in the post.Alpha-H Liquid Gold has been on my wish list for a while now, and I couldn't of been more glad that I finally got it. I'd read lots of rave reviews about this, so I was keen to get my hands on it. I'm really loving skin care products at the moment. Liquid Gold - with Glycolic Acid is a multi-action formula with silk proteins and licorice extract to refine and firm the skin. You apply it to a cleansed face every 2nd night, either with a moisturiser after it's dried or leave it by it's self overnight for an intensive treatment. I started my first night off with an intensive treatment and noticed the difference straight away the next morning. When you first apply the liquid you can feel a tingling sensation on your skin, which I like as you know it's working. The morning after my skin was super soft, i couldn't stop stroking my cheeks! I've tired this product twice now, and can already see why it seems to be everyones new favourite product, it's definitely mine. This product is great for most skin types (except sensitive skin), it gives your skin a new lease of life and leaves you with flawless skin. I would recommend trying it if you're looking for a new skin care product that really works. While I was on holiday in the UK last month I got a call from Inglot in Malta to say that they had a privilege card for me which would allow me to collect points and receive 50% off all products the day I picked up my card. I set a date to go a pick up my card. At first I hadn't heard the woman on the phone correctly about the 50% discount, it wasn't until I got to the till that I realised, I had just went along to pick up some bits and get my card anyway, but when she rung up my purchases with the discount...i decided to get some more pieces...you can't say no to 50% off!! Anyway, one of the things I got to try was their Freedom Palette. They must have about 100 different colours to choose from and these are the colours I picked. All quite neutral as I was playing it safe. This is the first time I've tried Inglot eyeshadow, and to be fair they are quite well pigmented and easy to build up if needed. I like the idea that you build your own palette. I think next think I'll be bolder with my colour choice. With my discount the palette only cost 18 Euros, which is a bargain for 5 eyeshadows and a case. But they did have it on offer for 25 Euros (without discount). Which is still a good deal. What do you think of Inglot eyeshadows? Another thing on my goodie list when visiting the UK was a trip to the Origins counter as i've not found a place that sells it online and delivers to Malta yet (if you know of one, please let me know). So after reading all the hype I couldn't swing by and not pick up some of this miracle solution I've read so much about. And lucky for me just after I bought I had a few spots appear on my chin! (what are the chances eh?). As everyone says, it's a tiny bottle (10ml) but you do only need they teeny little bit, and I can see this bottle lasting me 6 months or longer - for the amount of breakouts I have anyway. Once applied you can feel the solution working instantly, which it was quite surprised at. You feel a slight tightening sensation as it gets to work getting rid of your spots. The box says to apply 2-3 times a day, which I did and even by the end of the day I noticed the redness and size reduced and by day 3 it was almost like it was never there! Priced at £12.50 for such a tiny bottle can seem expensive, but the Super Spot Remover solution is really powerful stuff that actually works so I think it was well worth the money. I'll now be keeping this little gem handy for any future breakouts. Have you tried the Origins Super Spot Remover? The last two weeks I was back in the UK for my best friends wedding and before I went I made sure I had my "to buy" list of all the products we can't get in Malta. One of the things I'd heard about before I left was the No7 Foundation Match service, and I was keen to try it. For those who haven't heard about it, No7 have just re-launched their make up collection, including loads of new foundations and colours. They also teamed up with Pantone to make this great little gadget that tells you your exact skin colour so you can buy the perfect shade. They hold up to the clean area of the skin and the little device then takes a series of photographs in a matter or seconds, then it's repeated again on the other side of your face (It's 100% pain free) and voila you're done. I was told I was shade "Cool Ivory". I was looking for a matte, full coverage foundation and choose the Beautifully Matte foundation. The sales assistant tested it on my skin and we both agreed it was a good match. She then touched me up so I wasn't going around without half my foundation on! So one I got this baby home and tired it out, I have to say it's a very close match to my skin tone. Unfortunately I don't like being that pale so I like to touch it up with a little bronzer. As for the coverage, it's good but not as good as the Estee Lauder Double wear, but it's fine for day-to-day wear to the office, but i'd switch the the Estee Lauder for bigger events or night time as I prefer a full coverage to hide my freckles. Have you tired to Foundation Match Service yet? Price £13.50 - Available at Boots Stores. Everyone has their "thing", that one thing they obsess about and mine is eyebrows, as I've mentioned before. I've tweezed, threaded, waxed, and even HD brow'd them. I am on a quest for the worlds most perfect eyebrows, but alas they not perfect but they're getting there. When the lovely people at www.qvcuk.com contacted me and asked if i'd like to try out some Shavanta tweezers, I couldn't say yes quick enough. For those who don't know, Shavanta is the brow guru. This woman can perform a mini face lift in 15 minutes with just some tweezers and wax. 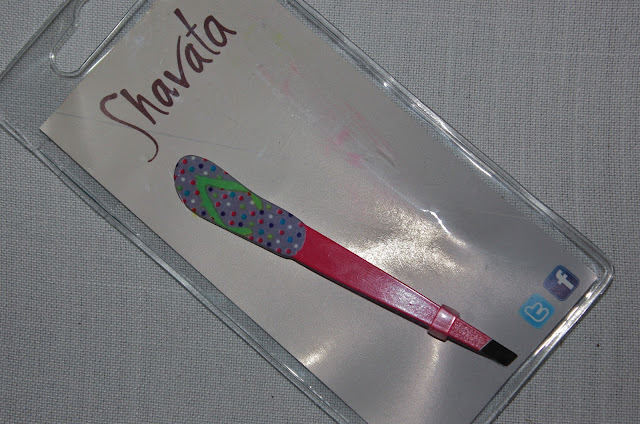 While personally I like to go the salon to have my eyebrows waxed once a month or so, I still need mini top-ups throughout the month and I do this by using tweezers, now my new Shavata Tweezers! While I need the beautician to give me a starting shape, I maintain my brows using tweezers to get rid of the nasty stray hairs that just seems to pop up over night (seriously, where do they come from?). Shavata have just launched their Totally Tropical Tweezer collection which comes in 6 amazing designs: - Neon, Sunglasses, Swimsuit, Bikini, Flip Flip, Kiki Cocktail and cupcakes and Cherry Glitter. The newly design Slanted tweezers provide a wider grip area and are especially good at removing hair in bulk with great accuracy. 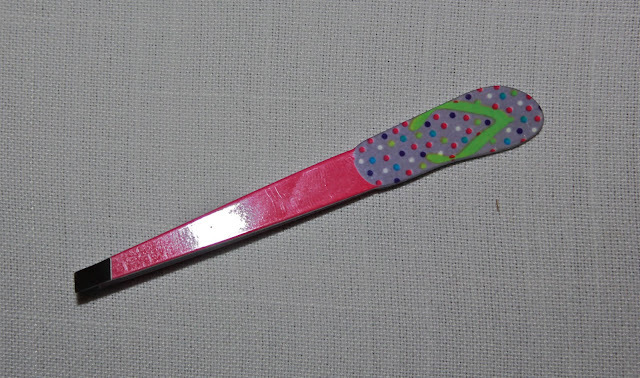 Each pair of tweezers is made with a stainless steel base, to help you"tweeze in a breeze". So if your in the market for some new tweezers, or need something to brighten up your make up bag - Shavata tweezers are a great addition. After being duped into buying a fake MAC Angel lipstick (see post) from an online shop here in Malta, I didn't want to risk it and bought Angel from the MAC store so I knew I was getting the real deal. Now I have quite a lot of MAC lipsticks - well not as much as some people but I do have a few and this is one of the few lipsticks that goes with almost anything. Angel is a soft pink which enhances my natural lip colour, it's so subtle yet still there. I like how it's not too in your face. It's not what I was expecting but I love it. Like all MAC lipsticks, it's slightly vanilla smelling but it doesn't smell once it's on the lips. The formula goes on the lips smoothly. If anyone is looking to buy their first MAC lipstick, I highly recommend you try this one out. MAC Angel is priced £13.50 and is available online and in stores. So I thought I'd do a Vlog today. I hope you enjoy it, I was quite nervous as you can probably tell. So I hope you enjoy it, I'll be making more soon. It seems like forever that I've been searching for a cheap but nice nail polish storage solution, so I was really happy when I found this affordable one on Amazon.co.uk for under £10 (£9.90). All the others i've found were £25+ and I wasn't prepared to pay that for something so simple! It's clear acrylic stand with 3 tiers, and holds around 30 nail polish bottles depending on the bottle shape and size, as you can see I have a mixture in mine and it holds 29. I now have this sitting on my dressing table so I can see what colour I want to choose. I actually have more nail polishes so I'll need to buy another one, but for now I have my favourite colours on show. I've been looking for a new mascara for a while, but couldn't decide on which one to get, so when I saw the Va Va Voom mascara get a 5 star rating on the Boots website, I decided to pop it into my basket. The first time I got to test this out was at a BBQ at our friends house, as someone who I'd never met before asked me I was had eyelash extensions. I was quite flattered but I put it all down to my new mascara. I'm lucky enough to be blessed with naturally long lashes, but this mascara does length and thicken. I've been wearing it every day since I bought it and can confirm it does give you some "Va Va Voom"
The shade I'm wearing it Blackest black and as you can see my lashes are really black, and for a mere £6.29 I think it definitely gives the premium brands a run for their money. A few weeks ago I was in Franks (The Maltese equivalent of Boots - or the closest you'll get) and thought I would get myself a little treat. So I chose some Chanel Eye Makeup Remover, which cost about €27 (I can't remember the exact amount, as I threw the receipt away in a handbag clear out!). Like any Eye makeup remover, it does what it says on the tin. I takes my eye makeup off rather well, but gently. I've actually got myself into a nice little night time skin care routine that I'm enjoying at the moment (but that's for another post), and my Chanel eye makeup remover is an essential part of my new routine. What's your little bit of luxury? Back in May I did a post about the NYX jumbo eye pencils I got, but I didn't have somewhere nice to keep them altogether and didn't want them sitting out (my dressing table is crowded as it is! ), so when I spotted this little NYX bag on Ebay for only £2.54, I knew it was the perfect thing to keep all my Jumbo pencils neat and tidy. It's actually the perfect size to keep your daily make up in your handbag as well and I'm thinking about getting another. I travel quite a bit back to the UK and with work and haven't found the right thing to store all my make up in yet, but this would be perfect for my hand luggage. I recently read a blog post about skin care on long haul flights, using masks and creams to help the journey go faster(and stay hydrated of course). What a great idea huh? I don't have any long haul flights booked, but i'm sure i could manage a mini facial on my up coming 3 hour flight to the uk. But I'll do another post of this later. What's your best storage tip? Labels: beauty, make up bag, NYX, nyx jumbo eye pencil storage.